Home » 2013 Shelby Mustang – sorry, no IRS. 2013 Shelby Mustang – sorry, no IRS. The spy pictures of the 2013 Shelby at the Nurburgring have been seen all over the net and are interesting to examine in detail. 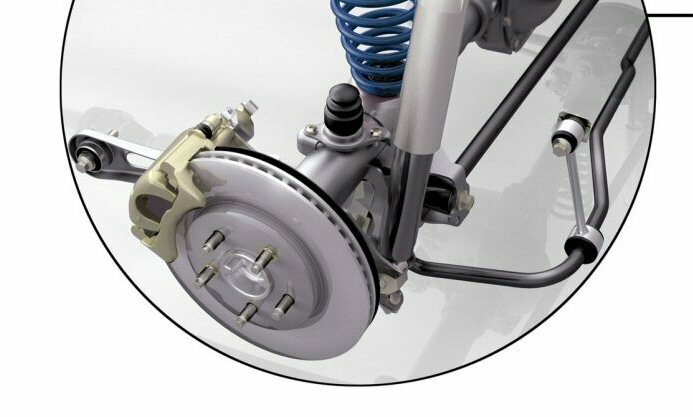 Focusing on the suspension, one publication claimed that the Shelby exhibited obvious negative camber in back, and concluded that Ford finally rolled out the IRS that it originally developed for the all-new S197 Mustangs. We’re very sorry to report that it doesn’t have an IRS: we’re here today to shoot down the IRS notion. It pains us to do so, because the Mustang very badly needs an IRS to replace ye olde solid axle. Covered-wagon axles from the mid 1800s have no place on a modern Mustang. And as you’ve probably been reading, the Mustang also badly needs a transmission, but that’s another story. Here’s the picture of the Shelby at the Nurburgring track in Germany. Look at the position of the brake caliper, and the size of the caliper. Same as all the other pedestrian Mustangs. Solid axle and stock brakes. Sorry, the IRS that was originally developed for the S197 stays on the shelf (picture below!). 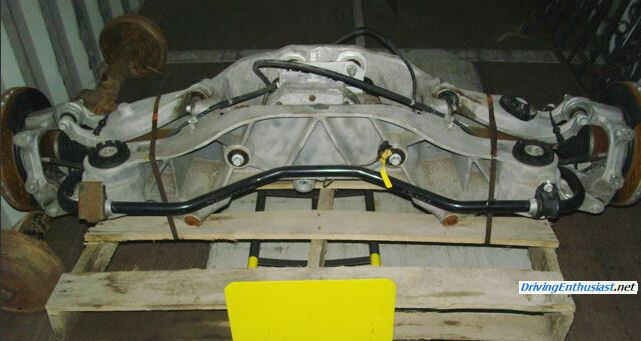 First, here’s what the pedestrian solid rear axle and brakes look like: very very very crude. 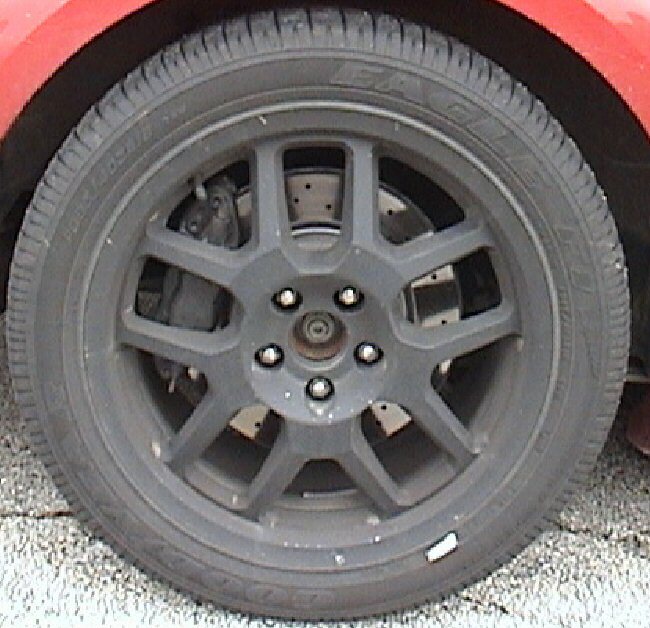 Here, on the other hand, is what the rear end looked like on the planned and partially announced (magazine interview quotes) 2005 or 2006 Cobra: note the IRS (large center nut) and 4-piston Brembo calipers. This prototype was spotted several times driving around Dearborn. Cobra, you say? Yes, a new generation SVT Mustang Cobra. However at the last minute SVT itself was all but eliminated due to quality disasters, the Cobra was cancelled, and the IRS was shelved due to financial cutbacks. Plans were dumbed down, the result was the Shelby Mustang with a solid axle, tiny rear brakes, 58.5% of it’s weight up front due to the substitution of an iron engine block, and multiples of poseur scoops and stripes and silly fanged worms. It’s gotten better since it first came out, but it still has faults inherent in the crude, tall, narrow, and top-heavy platform. And it will still hop, skip and jump if the pavement in the turns has any bumps whatsoever. Forget about back-roads drives. With a couple of brackets on the frame, it’s a simple bolt in. That’s a double a-arm design, with a massive but lightweight aluminum subframe. It’s total weight was lighter than the solid axle and of course it’s unsprung weight was considerably less. It uses an Explorer rear diff, and was designed to be more easily installed in the production line that the more clumsy SN95 IRS was from 1999-2004. The brakes are mounted to the rear, opposite that of the production single iron caliper on the solid axle. 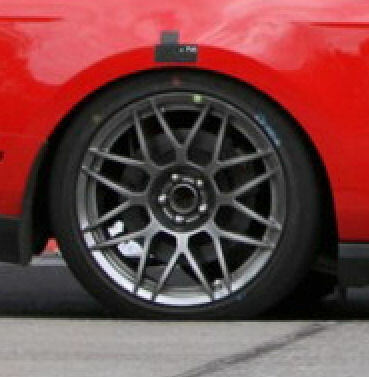 That makes it a dead giveaway to spot in spy picture now or back when the 2005 Mustang was being developed. You may well have spotted one then if you were driving around Dearborn with your eyes open… as several people did.